It's a story that begins with death -- with your death. Why did the Reaper reach out for you before your time? Why was it that you fell between the cracks? Do you remember the flare of the gun or the sharpness of the knife? Do you remember the gnawing emptiness or the choking thickness of disease? Did you fall across the Threshold alone in the wild, or in the heart of the city? The story begins there -- with the moment of death, and with the Bargain that reversed it. With the cold hand that brought you back to the living world, with the dry whispers that still haunt you, with the presence that has nestled in your soul. You've returned to a world where the living cannot see the shades that surround them. You drink rum to the dead, and you eat their remnants and legacies, taking their memories within you. Every night is the carnivale, because every night you walk with ghosts. You are the one with the key. 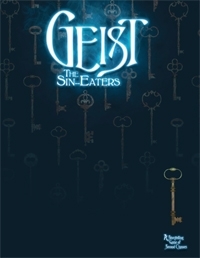 Geist: The Sin-Eaters is the sixth game in the World of Darkness. Geist 1.1 has been fully re-edited to include the latest errata and then developed again to insure that those editing changes fully conform with the themes and intentions of the original design team. This is not a new edition, but an overhaul designed to insure that this version of Geist is everything you need to play the game. I found an errata page 112 in the Boneyard section it only said "Stigmata: The Sin-Eater can perceive and affect ghosts within.... // Stillness:The Sin-Eater can dull the perceptions of others within..." should be "Stigmata Boneyard and Stillness Boneyard"
Does this edition require the use of the core COD rulebook? Yes, it need World of Darkeness 1st ed Core, like all the old 1st edition splat material of NWoD (now CofD). You would need the previous CoD (before God Machine Update) if you don't have it, the only thing different is experience system of CofD (2nd edition). I bought the hardcover color standard version. The printing on the sides of the pages has a lot of ink and caused the pages to curl up, making it VERY hard to read/use. Also their are certain pages where the printing from the previous page has bled through. The binding isnt bad on this one but the heavy ink on the very thin pages is a problem. I own a few of these POD books now and some came out good some bad. Just my experiance, but keep this in mind if you buy the POD version. Maybe try tracking down an original or just stick with the PDF version. Will there be a premium color edition? I'd really like to own one. I own the black and white printed book. Portions of the text are difficult to read, and many of the images are obscured in that format. Like Mateusz J said, please bring back the POD color print. Better yet, please make a premium color version available. And for Hunter, too. Even though I own both in black and white, I probably would buy them again if that were an option. Please, bring back option for POD color print. Even "standard" one is better than b&w with those awful white borders. This title was added to our catalog on August 19, 2009.